It doesn’t take long to start to miss the little things when you move away from home, especially if it’s to another country. For me it was breakfast. I am a huge food aficionado and while Korea has so much to offer , breakfast here just isn’t the same as back home. Sure, it’s not to difficult to whip up a batch of pancakes, eggs and bacon but it’s not the same as getting it from a restaurant at 2:00 in the afternoon like you can at Denny’s, IHop or Carrows. However, I need not search any further. I found the perfect restaurant to satisfy those breakfast hankerings. Butterfinger Pancakes is everything you could want for breakfast and more. It’s designed with a chiq american diner flare. Mainly earthy orange and brown tones swept across modern (slightly uncomfortable) furniture. 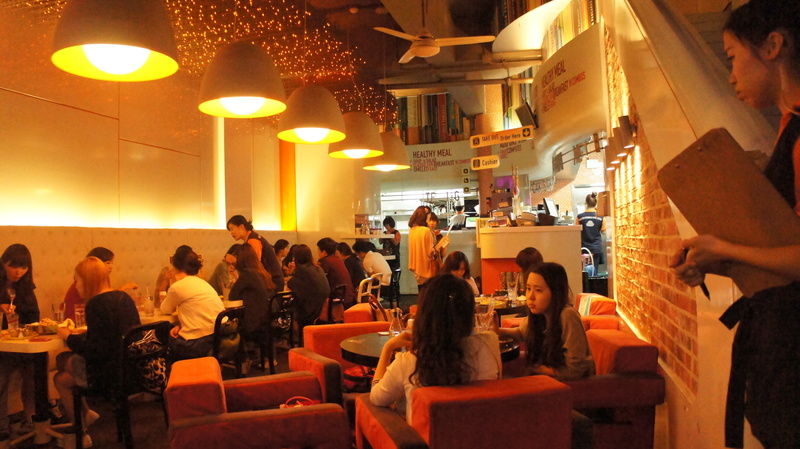 It has two floors (one of which closes at 10pm, while the other remains open til 3am). To my knowledge, there are only two locations; one in 강남 (Gangnam) and another in 압구정 (Apgujeong) Just a tip, when you go make sure you’re not on a tight schedule. I have gone a few times and no matter when I go, there is always a wait. I assure you it is well worth it. On to the food! The menu is a ridiculously over-sized double sided monstrosity. 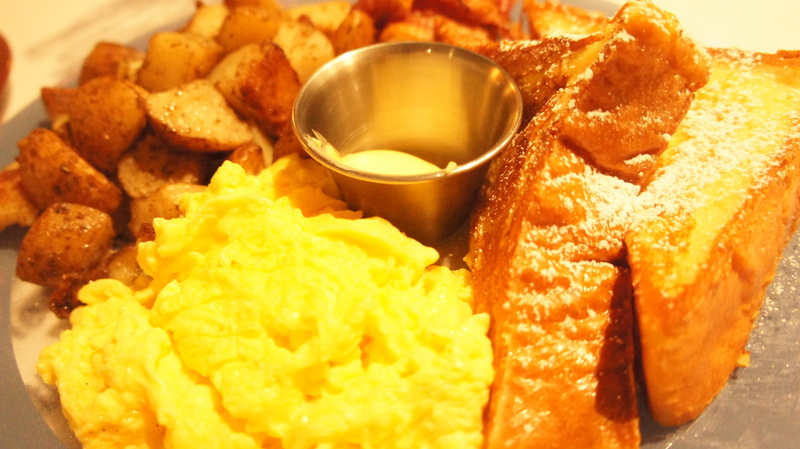 From crepes and pancakes to french toast and chicken fried stake, they have it all. 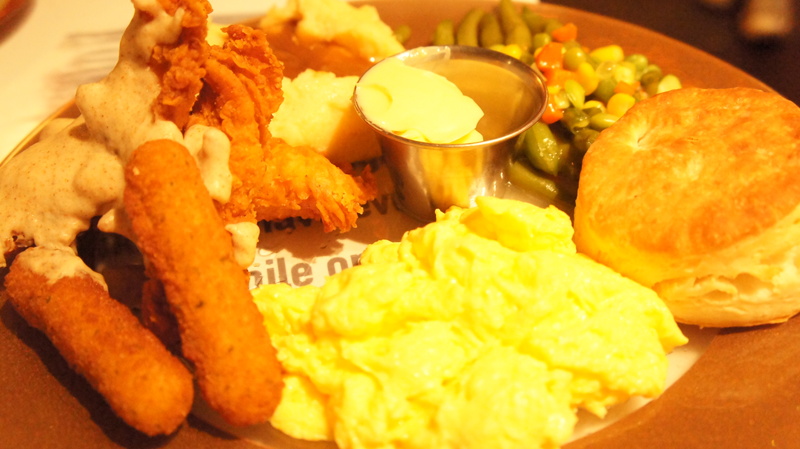 Every dish comes with sides such as eggs, bacon, sausage etc. 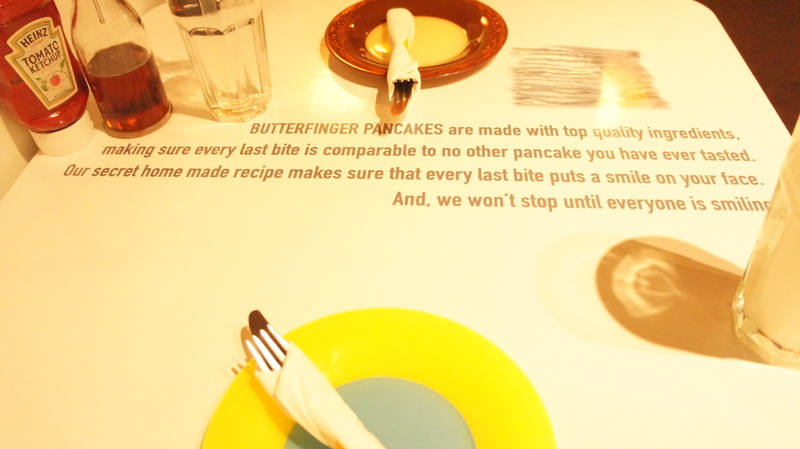 You also have the freedom to further customize your meal with choices of syrups, butters and egg styles. The price is a bit on the higher side with of an average of 12,000~18,000₩ per meal, but the portions are very generous and I am yet to be disappointed. Being a huge french toast lover I can’t help getting the same dish (Jeanne’s French Toast Special) every time, but luckily my boyfriend is a little more adventurous than I am, so he gets something different every time. We always split our meals, so we get to sample a lot more (remember: sharing is caring). Be warned, one meal is enough for two. My boyfriend and I always get separate plates and we always end up leaving the restaurant a little… how shall we say, “off balance”? All the food is absolutely delicious and the smell is enticing. Dining here is an indulgence to the senses. I truly mean INDULGENCE. There is nothing healthy about the food here, everything is greasy and carb-filled, but I believe that’s the way breakfast should be. For those of you who do fear the inevitable consequences of adding this food to your diet, however, there are options for you too. Their salads are immaculate! Fresh, crisp and served in a bowl the size your head (not an exaggeration). It is definitely worth trying. During your visit you will surly catch a glimpse of their unimaginable sugar-comma inducing desserts. While I am yet to try them, it is definitely on my list of things to do. On that note, get out there and feast till your heart’s content. Always feel free to comment back with recommendations from your food-filled endeavors. Until next time, happy eating! 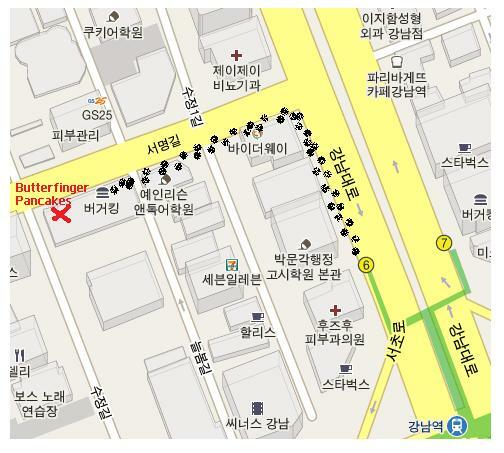 To get to the Gangnam location, either follow the map below or copy and paste (37.498844,127.025428) into Google maps. Take the #6 exit out of Gangnam Station (#2 Green Line), walk straight and take the first left. You'll pass by an American Apparel store and straight ahead you'll find a Burger King. 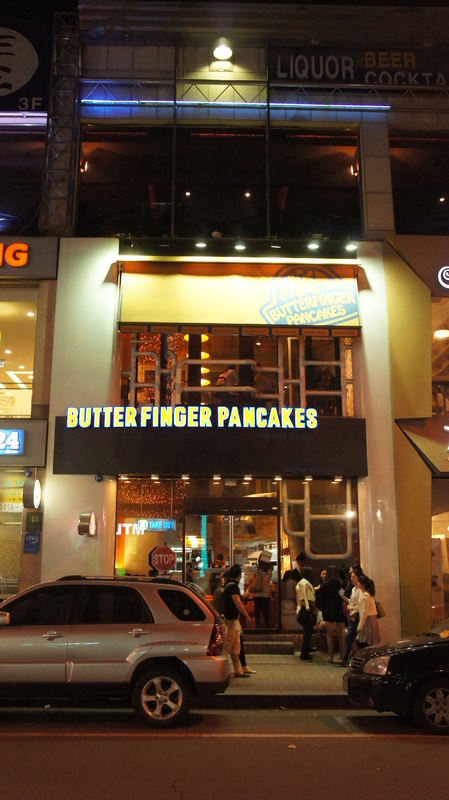 Butterfinger Pancakes is right next door. Tags: Best restaurants in Seoul, breakfast, Breakfast in Korea, Butterfinger pancakes, 강남, Gangnam, Gangnam Brunch, Korea, Restaurants in Gangnam, Western Style Food in Korea. Bookmark the permalink.